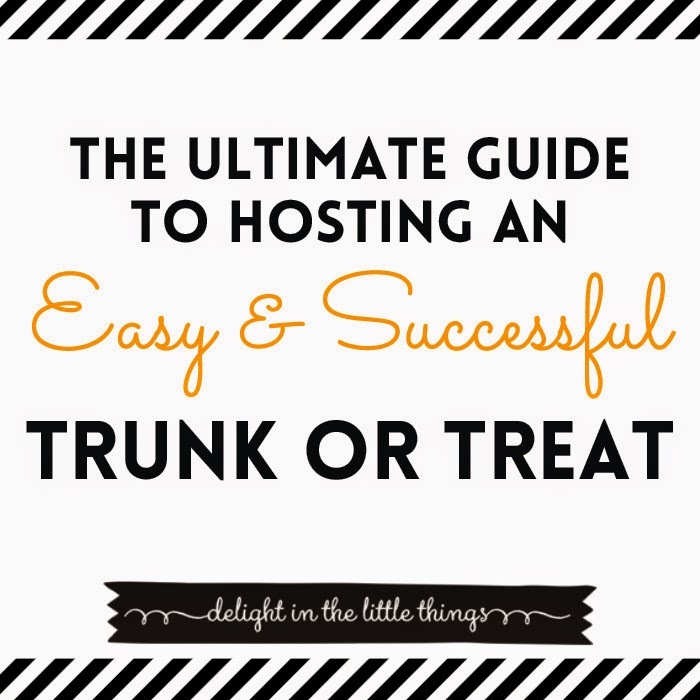 We are so excited to share ideas we've learned in this Ultimate Guide to Hosting an Easy & Successful Trunk or Treat! Many years ago we posted about a Trunk or Treat that our Sunday School class hosted for a very small group at our church. Fast forward six years, and our church's Trunk or Treat blossomed and grew to be a very successful event involving over 400 people. For those who don't know, the idea of a Trunk or Treat was born from the desire to offer a safe alternative for families wanting to Trick or Treat. Usually held in the parking lot of a church or community park/center, the basic set-up is getting volunteers to host a trunk and hand out candy as families walk from car to car. After hosting it for so long, we learned some great lessons and want to share some of our best tips to help you host a fun and safe Trunk or Treat! Each year we debated on when to have our Trunk or Treat. As an "alternative" to Halloween Trick or Treating, it makes sense to have it on Halloween evening. However, many of our volunteers usually had family plans for those nights and so we always ended up hosting it on a weekend night right before Halloween. Our best attended events happened on Friday nights, but it did pose an extra challenge for set-up. We found an hour and a half to two hours to be the right amount of time for the event, and that it was best to end before dark. In order to accomplish this, we had to have volunteers setting up their trunks between 4:00 and 4:30. This can be hard for some volunteers who can't leave work early, so be sure to consider this as you set your timeframe. The most important thing you can do as you start to plan is to walk the parking lot where the event will be held and think about traffic flow--both people and cars. You do not want any cars driving near the Trunk or Treat during the event itself. It's best to rope off an area of the parking lot and plan for cars to be parked on either side of the aisle, keeping usually one space in between the cars. Clear signage letting visitors know where they can drive and park keeps the area where kids and families will be walking clear of danger. We've used rope, orange cones, volunteers directing cars, they all can work; it's just important to have a plan and a system. Directing people is just as important as the cars. Having signage that shows where to enter the Trunk or Treat helps keep people on the "loop" that you are creating in the parking lot. People like to be told where to go, so we found it helpful to have a table at the entrance of this area welcoming visitors and also providing extra bags to kids who didn't bring one. If you have the interest and/or volunteers, you can use this table to hand out brochures about your organization or collect useful visitor contact information. Mostly it's important that people feel welcomed to your event, and for families to feel that's a safe environment for their kids. If you do decide to have the event last into the evening, don't forget about outdoor lighting. Make sure there is plenty in the parking lot, and you may need to consider a generator for additional lighting. Things you may need: traffic cones, a roll of orange safety fencing, reflective vests, and extra treat bags. For our event, we found that getting at least 20 cars was optimal. We had the cars parked one space apart, 5 on one side and 5 on the other, taking up two lanes of the lot. Interspersed at the end and in between were some of the booths and extras (see last section below). When asking for volunteers, it's important to clarify that you need them to arrive at least 30 minutes before the event to park and set-up, and that they won't be able to leave until the event is over. (You don't want any cars driving where kids and families will be walking.) We always encouraged volunteers to decorate their trunks. Lots of folks found this to be a really fun part of the event! We've had big trucks with hay and pumpkins, fancy vintage cars, and themed trunks to match costumes. People can be really creative with sound, lights, etc. Just make sure that you explain any policies or guidelines about how scary the decor can be ahead of time. Some volunteers will ask about bringing their own candy/items to hand out to the kids. Again, this is for your group to decide. We recommend coming up with some guidelines, especially if you have concerns about allergies, etc. It's always good to make sure everyone's on the same page to ensure a great event. This site has some amazing ideas for decorating trunks and incorporating costumes. This is a must see for inspiration! First, keep in mind that a Trunk or Treat is usually an alternative to actually Trick or Treating in a neighborhood. So, families and kids will come with the expectation of candy. Lots of candy. This can be expensive, so we set up donation boxes around our church several weeks before our event asking for candy donations. Since our Trunk or Treat was also an event for our preschool, we had donation boxes near the Preschool Director's office as well. We always had to purchase more candy (sometimes during the event!) and we relied on places like Costco and Walmart to buy big variety bags. We also asked that those who handed out candy try to limit 1-2 pieces per child, particularly when we had lots and lots of kids coming. We also tried to provide candy-alternatives, like stickers, tattoos, little spider rings, etc. Depending on your event and the ages of the kids, this might be a better choice than candy. One year a local dentist and his staff hosted a trunk and they handed out toothbrushes and other dental care items. Dressing up is a big part of the fun. We always encourage volunteers and those hosting a trunk to come in costume. If you think there could be problems, you may want to establish a guideline or policy around how scary you want the costumes to be. You never want little kids to be so frightened that they want to leave or not come back in the future! A kids costume parade can be a neat part of the evening. Besides being lots of fun for the kids, it's a great photo op for your future event marketing materials. Be sure to set a time in advance and include it in your advertising so that families who want to participate won't miss it. Extras that add big fun! Face painting is always a big hit and low cost, especially if you have artistic teens who are willing to volunteer time to be a part of the event. We like this kit. Hayrides are a lot of fun for kids. We did a pretty low tech version. First, it was hayless to cut down on potential allergies. We had a tractor attached to a trailer with wooden sides. It moved very slowly around the edge of the property. Pumpkin decorating is a great addition. We raised money for the local food bank by auctioning off the pumpkins afterward. In our case we had a preschool that provided the pumpkins and decorated them as a class. They were amazing! Invite the local fire department to be a part of your event. If their schedule allows, they love to be involved. Be sure to call early because October is fire prevention month and schedules tend to fill early. Bounce houses and big slides are always a crowd-pleaser. These tend to be overdone a bit, but still attract crowds. We found the slides a little easier to manage with the variety of ages that attend. Find a vendor that will staff their own inflatable to cut down on additional volunteers. One innovative idea that turned out to be a lot of fun was a maze made out of string and plastic. The string was tacked to wooden poles to make the maze. The plastic - think long rolls - was draped over the string. It was positioned higher than most of the little heads so it was challenging. The kids loved it! We always had some extras around like side walk chalk or other crafts for kids available. This was appreciated by parents as sometimes the kids can get through the treats pretty fast. The crafts are a nice diversion. That's it! Hope you found this guide helpful for your event. 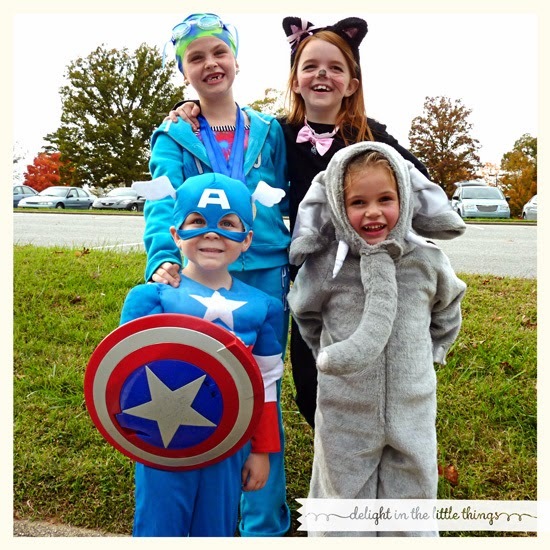 Have you helped host a Trunk or Treat? What worked well for you? Follow Sassafras Paper's board halloween on Pinterest.